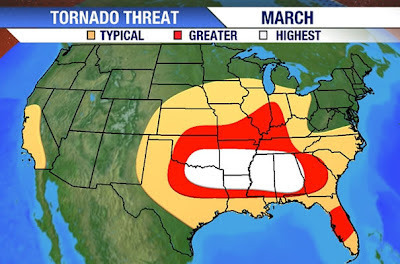 In the south you can always tell the onset of spring not by the appearance of the robin (they've wintered here) nor by the blooming of the azaleas (they got a head start at the beginning of February) but by the wail of tornado sirens. I haven't heard any myself yet today, but considering that I went outside at 7 AM in short sleeves and it's March 2nd I will probably be hearing them by late afternoon. If you live in an area of the country that is at higher risk for severe weather, I strongly urge you to have a weather radio in your house. Don't just get the kind that offers a 24 hour forecast if you press a button; get one that you can set to go off if a severe weather warning is called for your area. At 2 AM you are highly unlikely to wake up and think, "hey, I think I'll push this little button and check the forecast". 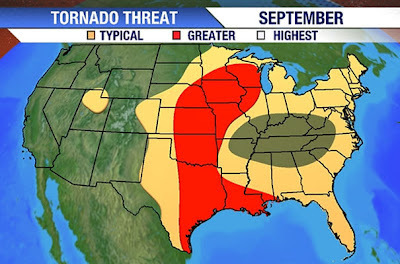 You are far more likely to be asleep in your bed and unaware of the tornado sneaking across the county line into your backyard. 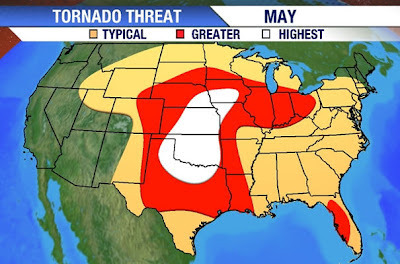 Many communities have sirens now but if you live in an area without one or are in a rural area or you are like me and simply can't hear them unless you're outside, then do yourself and your family a favor and get a weather radio. 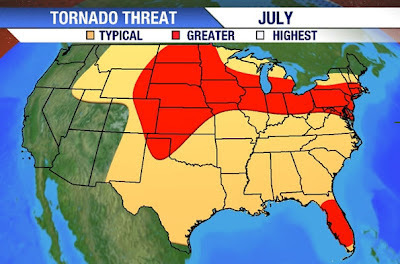 Speaking of severe weather risk, there are maps for every month indicating the relative storm risk in any given area. Let's have a look at them. 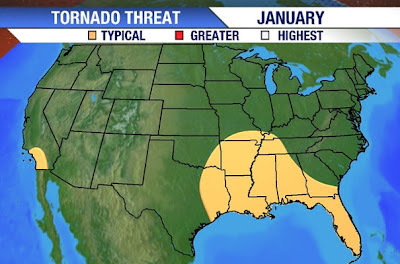 January: Ok, tornadoes are rare in January but they happen. February: Aha! Notice the risk has gone up dramatically. March: Now we're talking. 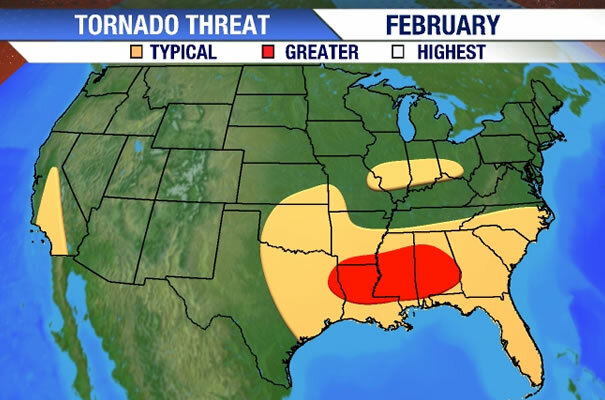 Notice that the risk is not primarily in the traditional "tornado alley" but in the southeastern states. For the uninformed (or formerly uninterested) this is actually called "dixie alley". 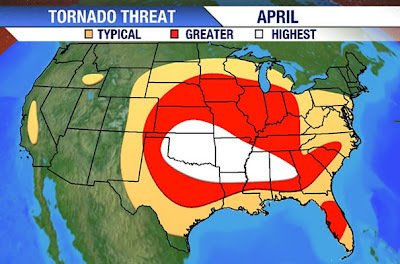 April: The slide off to the west begins as things start to heat up in tornado alley. May: You see how the area of greatest risk has now moved off to the northwest. 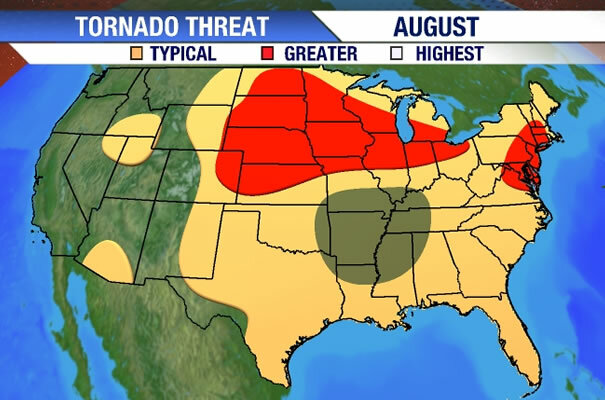 The risk is the greatest in tornado alley. 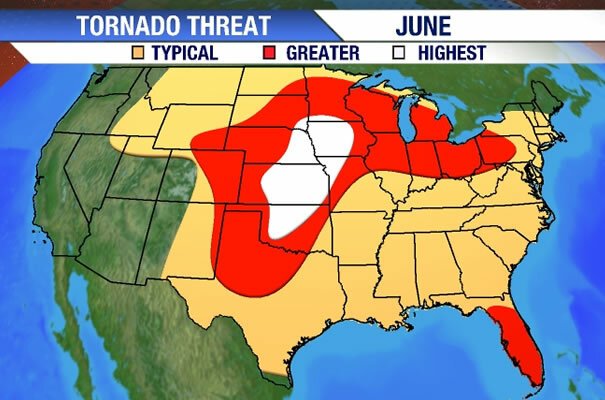 June: Mostly the same as June but concentrated a little farther north. July: July is pretty uniformly hot so you're not having quite as many clashes along frontal boundaries. August: Notice the threat in the south has decreased to below even that of January. September: As things start to cool off a bit the threat starts its slide back south. 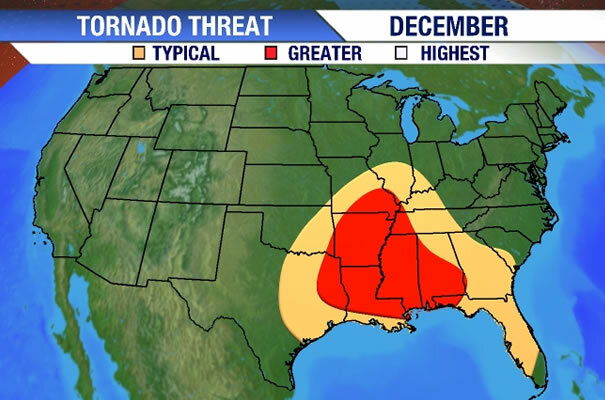 A lot of tornadic activity this time of year is associated with hurricanes and tropical storms. 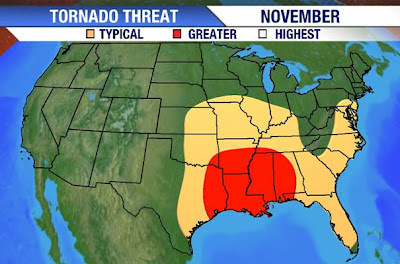 October: The threat is not gone, but it is pretty tame in general across the U.S.
November: Here we see the south getting its second wind. 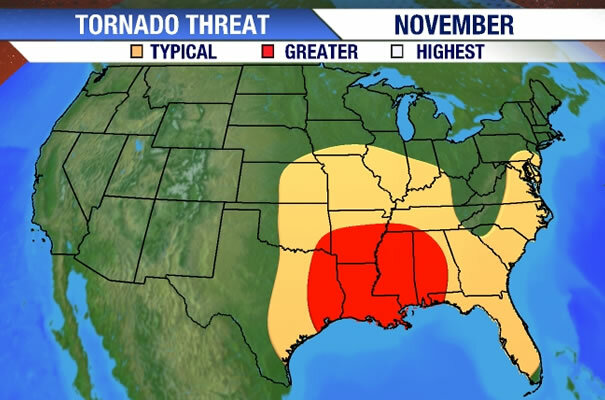 November is the second peak for the lower Mississippi valley. There are plenty of hurricanes this time of year too. 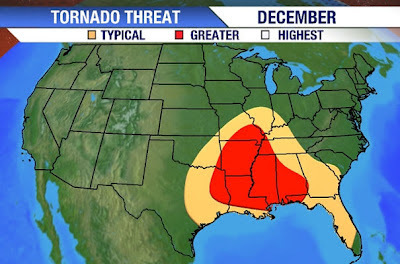 December: No one thinks of Tornadoes in December, but they occur. 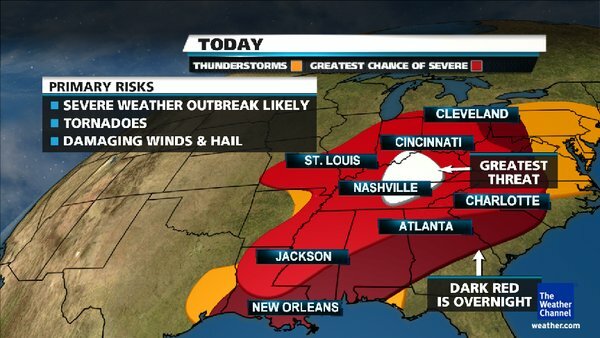 Weather in the south can be very changeable and strong fronts are not uncommon. 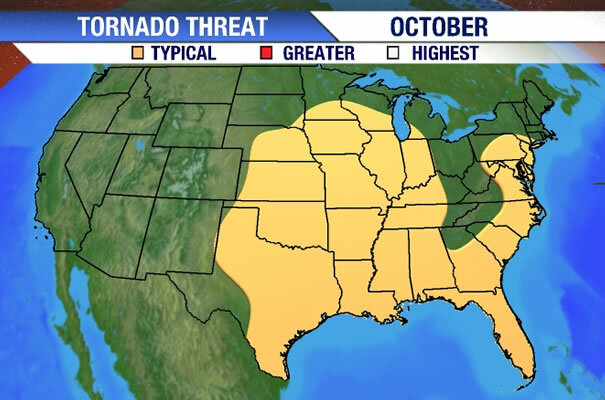 Remember, even if you live in an area considered low threat, like Washington state, tornadoes and severe thunderstorms can still occur. Check this site for tornadoes by state (also just a fun site). This is really interesting. I don't think of tornadoes much except for during the spring.